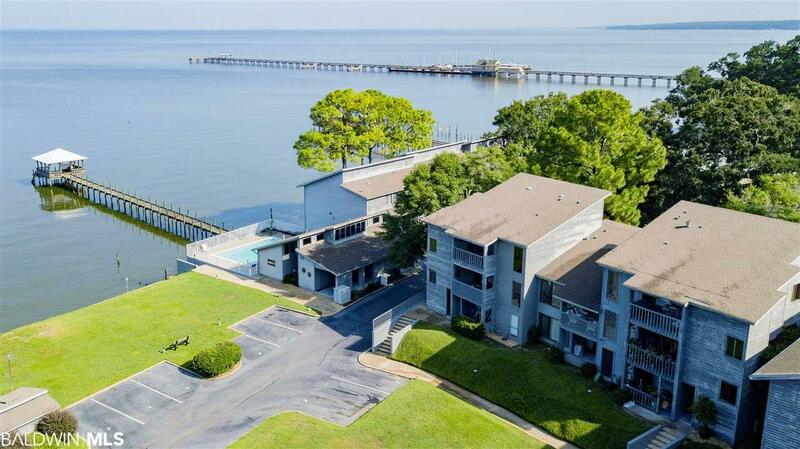 Living in Bay Winds Condos on Fairhope&apos;s charming S. Mobile St, you are really able to feel the &apos;bay winds&apos; from the front porch of this ground level condo on the Mobile Bay. Plus, you&apos;re within walking distance of all that Fairhope has to offer. This unit has been all dressed up. The interior completely repainted ceilings to floor, including kitchen cabinets painted inside and out, new plank vinyl flooring and new carpet. Enjoy the swimming pool while watching the sunsets and fish from the private fishing pier with covered gazebo. Invite you friends for a gathering in the club house and treat them like kings and queens. You would not want to miss this great property call today for a viewing. Directions: From Fairhope Ave Go To South Mobile Street Continue Past Fels Ave And Bay Winds Condo On Right, Bay Side. Take North Entrance And Unit 17 Is In The Second Stack Of Units At Street Level.